'Loft' Starter Set - a fresh contemporary design that is functional and flexible with lots of casual elegance. 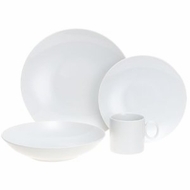 Manufactured by Rosenthal, one of Germany's most prestigious porcelain manufacturers, the set includes 4 11" dinner plates, 4 81/2" salad plates, 4 91/2" soup bowls and 4 mugs. Pure white porcelain highlighted with a subtle white on white line relief design, the Loft pattern lends versatility and creativity to everyday dining and entertaining. Dishwasher and microwave safe. Additional pieces are available open stock in the Loft collection providing a complete range of dinnerware and serving options. Loft is used in many restaurants and hotels around the world and shows off every kind of food to its best advantage.